This volume explores the distribution of the rural population in Palestine from the late Ottoman period (1870-1917) to the British Mandate period (1917-1948). The book focuses on demography, specifically migrations, population size, density, growth, and the pattern of distribution in rural Palestine before the inception of Jewish settlement (1882). 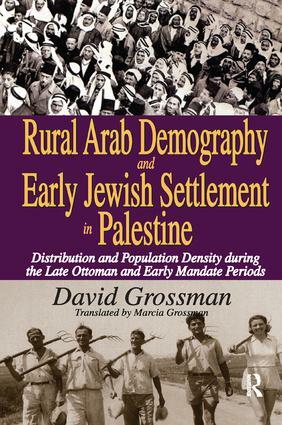 Grossman traces little-known Muslim ethnic groups who settled in Palestine's rural areas, primarily Egyptians, but also Algerians, Bosnians, and Circassians. The author argues that the Arab population in the zones occupied by Jews after 1882 was about one-third that of the Arab core areas; in the period studied, the decline in per-capita rural Arab farmland was mainly due to overall population growth, not displacement of Arabs; economic development suffered largely because of violent disturbances and natural disasters; the pattern of growth of Egyptian and other Muslim groups was similar to that of the Jews. The main conclusions of this study note that the size of the rural Arab population in the zones occupied by Jews after 1882 was about one-tenth of that which occupied the Arab core zones; most Egyptian settlement areas coincided with those of the Jewish zones; between 1870 and 1945, the decline of Arab farmland was mainly due to Arab population growth rather than Jewish land acquisitions; and most migrants (Jewish and Muslim) settlement zones were leftovers characterized by some form of resource disability.